Where do I use my Olympic Holidays voucher code? Once you have found your holiday click View Hotel and Book. You will be displayed with your room type and flight details. Please edit these if necessary. Below the holiday extras are where you can now enter your promotional offer. Your booking summary below will be automatically updated with any discounts. "Check out the ‘Holiday deals’ section for a great selection of last minute Greek holidays." Well known for their holidays to Greece and Cyprus, Olympic holidays have expanded their range of destinations to include Turkey, Bulgaria, Egypt, Malta, Gambia, Tunisia, Portugal, Goa and more. Olympic Holidays offer all types of holidays including beach holidays, adventure holidays, budget holidays, all inclusive holidays and cruises. You can also arrange a wedding package with them for an affordable price, to make your special day one to remember. Olympic Holidays offer regular deals on flights, hotels and holidays, with packages on flights and hotels to stunning locations from their destination list. You'll also find plenty of all inclusive deals that will have you and the family jumping for joy, with unlimited drinks and fantastic entertainment available in your resort, all pre-paid for before your holiday. There are also lots of late deals at reduced prices, so you could find yourself jetting off for half the price on a spontaneous holiday just days after you book. With Olympic Holidays you can journey to beautiful destinations around Greece, visiting sun-kissed beaches, turquoise coastlines, and hideaway coves. Olympic Holidays Greece will create your unforgettable Greek odyssey in locations like Crete, the Ionian Islands, the Sporades Islands and Halkidiki. Greece is a place with a rich, cultural heritage, a magical history, and tranquil sparkling beaches. Jetaway to Greece with Olympic Holidays and wander through olive groves and fragrant hillsides, discover sleepy streets and cobbled villages with blue and white architecture that bring the Islands to life. Watch the sunset over this paradisiacal land or party all night long in the warm summer air. Olympic Holidays offer fantastic getaways to Greece, check them out and enjoy a holiday of a lifetime. Olympic Holidays offer last minute holidays to a range of destinations. If you’re feeling fed up and bored of gloomy UK weather or you simply just need to get away then this is the perfect option for you. Last minute holidays don’t need to be stressful, with Olympic Holidays late deals you’ll find packages and fantastic deals for last minute escapes, so you could be jetting off just weeks or even days after you book. Be spontaneous and book a last minute holiday, with plenty of benefits including a reduction in price, you’d be crazy to miss out. Cyprus is a gorgeous location that’s blessed with lots of sunshine all year long, retaining a welcoming warmth that will keep you coming back. Cyprus is the legendary birthplace of Aphrodite, the goddess of beauty and love, extremely fitting for this breathtaking place covered in glorious, golden beaches and beautiful blue sea. Visit this wondrous location with Olympic Holidays Cyprus and discover tiny villages nestled in vineyards, mysterious shipwrecks, the Tombs of the Kings of Paphos, castles, churches, and mosques, that, together, make up this Island, rich in culture and in no short supply of beauty. If you head to the exotic Island of Cyprus with Olympic Holidays you’ll be welcomed with a homely atmosphere, where the English language is widely spoken. You’ll never be bored, with a number of trips, beaches, lively nightclubs and wonderful cuisine, there’s always something to do, or see. And, with a marvellous setting of herb-scented hillsides and pristine beaches, Cyprus makes the perfect holiday location. If you need to make an amendment to your booking please call Olympic Holidays on 020 8492 6799. Do I need to give my passport details in advance? For security reasons most EU States and other countries now require airlines to provide details about their passengers before they travel which includes passport information. To cancel your booking please contact Olympic Holidays as soon as possible. Olympic Holidays is an online travel service specialising in 50 European destinations. From Greece and her islands to the Canary and Balearic islands with Cyprus, Corsica, Malta, Sicily and Sardinia between, they offer a fantastic variety of beautiful destinations. 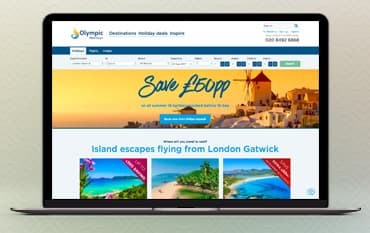 Use one of our Olympic Holidays Discount Codes to get a great discount on your package holidays, hotels or flights and then you will save even more on your holiday booking. At Olympic Holidays they ensure a holiday that is 'made for you’ delivering first-class holidays that combine great travel services with unrivalled value for money. Their experts’ in-depth knowledge of the destinations and desire to create magical holidays ensures guests benefit from the best choice of getaways from short breaks to premium 5-star luxury holidays. We are constantly on the hunt for Discount Codes for Olympic Holidays to help you with your money saving. Our experts check dozens of sites for secret codes including NHS discounts, student sites & social media channels saving you time & money!